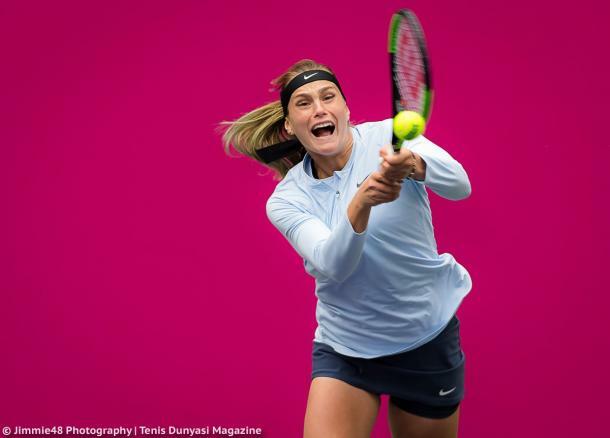 A new star is in the making after Aryna Sabalenka broke into the top-100 for the first time in her career, with her future looking bright. 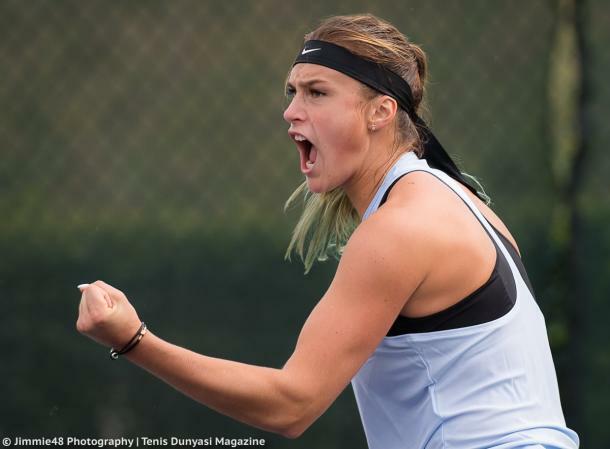 Aryna Sabalenka has had an incredible breakthrough year, breaking into the top-100 of the rankings while reaching her first WTA final of her career. Furthermore, she created history for Belarus in the Fed Cup while also reflecting her potential and talent to fans all around the world. 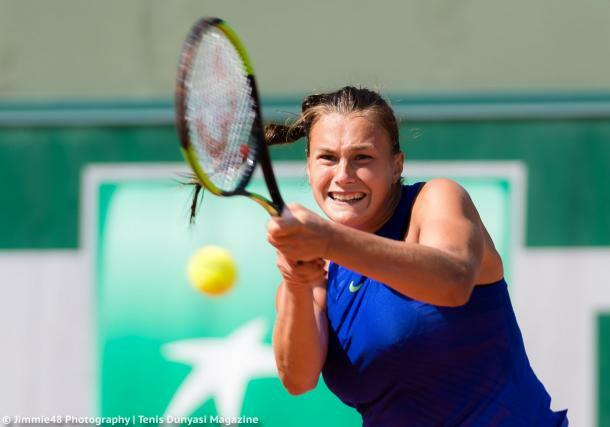 Tipped as the future of Belarus tennis, Sabalenka has also been compared to Maria Sharapova and Victoria Azarenka and has a great future ahead of her at the age of 19. Sabalenka owns a 36-25 (.590) win-loss record throughout 2017, including ITF events. The Belarusian youngster claimed seven wins over top-100 players in this year alone, compared to just one in her career before entering 2017. It has been a year of “firsts” for Sabalenka — entering the top-100 for the first time in her career, qualifying for her first WTA event, making her debut in the main draw of a Grand Slam, reaching her first WTA final before ending the year with her first WTA title in Mumbai. Sabalenka played a pivotal role in Belarus’ World Group first-round win over Netherlands, earning one point for her country. Being ranked 142nd in the world, the Belarusian had no expectations coming into the tie but almost clinched a huge upset against world number 26 Kiki Bertens, falling in three sets after holding a match point. Nonetheless, she managed to oust Michaella Krajicek in her second match, sealing the historic win for Belarus as they progressed to the semifinals for the first time in history. Sabalenka was once again a pivotal player during Fed Cup play, defeating Viktorija Golubic in the fourth rubber to seal a commanding 3-1 win for Belarus. Against both Netherlands and Switzerland, the Belarusian played the role of a hero as she claimed the ties for her country in front of a supportive partisan home crowd. This also sent Belarus to their first-ever Fed Cup final. 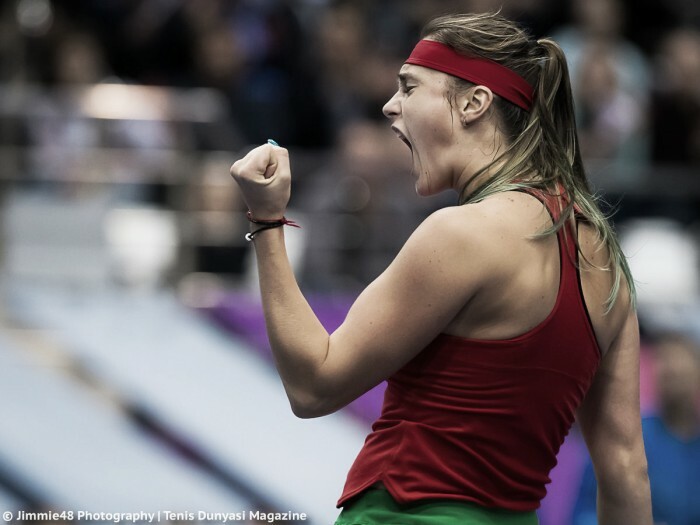 Fast-forwarding to November, Belarus hosted the USA for their third consecutive tie in Minsk, Sabalenka had the golden opportunity to claim a historic win for her country. She produced an impressive performance to oust Sloane Stephens for the biggest win of her career but fell to Coco Vandeweghe in the next rubber. Nonetheless, with Aliaksandra Sasnovich’s heroics, they managed to bring the tie into a deciding doubles rubber. She teamed up with Sasnovich, and despite producing an extremely tough fight, they ultimately fell in straight sets. Despite the loss, it was an incredible run for Sabalenka and Belarus. The Belarusian reached her first final of the year at the ITF 60k event in Shenzhen, where she was unseeded and looming. She impressively reached the final without losing a set but ran out of steam in the final as she fell to Ekaterina Alexandrova in straight sets. 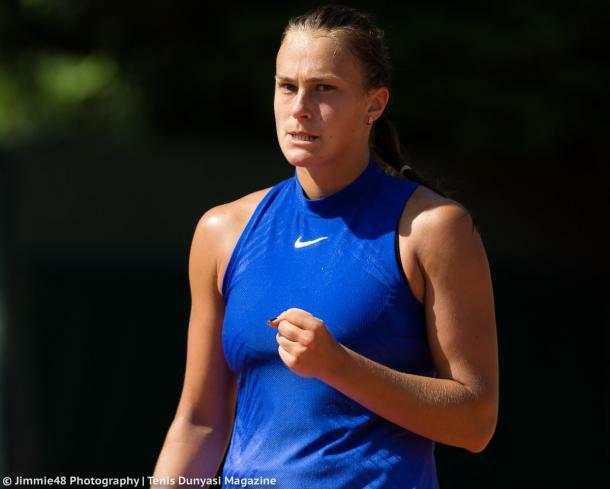 Sabalenka continued to break new grounds, powering through the Wimbledon qualifying rounds in Roehampton to qualify for her first-ever Grand Slam main draw appearance. Certainly, the hard-hitting Belarusian’s explosive and fearless game works extremely well on the fast-paced grass courts. Her good run continued, defeating Irina Khromacheva for her first Major win before falling narrowly to Carina Witthoeft in the second round, despite leading by a break in the final set. Carrying the momentum into the US hardcourt season, Sabalenka shocked home favorite Lauren Davis for her first win over a top-50 player in her career, progressing to the second round of the Citi Open and thus earning her first win on the WTA tour this year (bar Grand Slams). However, she lost to Sabine Lisicki in a tight three-setter having failed to convert a 2-0 lead in the decider. Reaching new heights in her career, Sabalenka produced an incredible run to the semifinals of the Tashkent Open for her first ever WTA last-four appearance. Defeating three consecutive top-100 players, Sabalenka edged towards a top-100 debut having been just a couple of points away from entering the elite batch. The run just continues for Sabalenka. When she is having a good day, the Belarusian is almost invincible. Moving onto the Tianjin Open, the youngster stunned the home crowd by ousting three consecutive Chinese players before upsetting former world number five and qualifier Sara Errani in straight sets, easing to her first WTA career final losing no more than four games in a set in the process. Facing childhood idol Maria Sharapova, Sabalenka wasted 4-1 and 5-1 leads in the first and second set respectively, wasting many of her opportunities as she eventually fell 5-7, 6-7 in a thrilling two-hour final and despite the loss, her fearless tennis earned many fans from all over the world. During her last tournament of the year at the WTA 125k event in Mumbai, Sabalenka lost just one set en route to claiming the biggest title of her career. Nonetheless, she still had to get through a tough second-round match against Lu Jiajing, recovering from 3-5 down in the final set and the Belarusian eventually strolled to the title without losing more than four games in a set for the remainder of the week. This also propelled her to a career-high ranking of 73, with a top-50 debut looking highly possible next year. Sabalenka’s main weakness throughout the year has been her inconsistency. Her explosive game works well when it is firing on all cylinders, but when it isn’t her day, Sabalenka will struggle on the court and consecutive unforced errors would come off her racquet. She has been unable to perform well against those players whom she is expected to beat, and therefore it has been one of her low points throughout the year. Sabalenka had a poor start to the year as she was unable to qualify for any tour events throughout January. She failed to take her chances occasionally, but the Belarusian finally qualified for the main draw at the Dubai Duty-Free Tennis Championships, where she ultimately lost in the opening round to Kateryna Bondarenko. Being least-efficient on clay, Sabalenka participated in four clay-court tournaments this year and fell in the opening round thrice. The Belarusian surprisingly crashed out in the first round of qualifying in Rabat, losing to the lower-ranked Ivana Jorovic before reaching the quarterfinals at the ITF 60k event in Saint Gaudens. Sabalenka then exited in the qualifying of Roland Garros, ending her clay-court season in the process. Another low point of her season featured Sabalenka falling in the first round of the US Open qualifying event, which featured a “Shot Clock” for the first time in history. The seventh seed was upset in the opening round, missing out on a golden opportunity to qualify in Flushing Meadows for the first time in her career. Towards the end of the year, Sabalenka had to defend finalist points at the ITF 50k event in Japan but opted to compete at a larger WTA 125k tournament in Taipei. Being the top seed, the Belarusian was affected by fatigue after flying straight from the Fed Cup final, and eventually lost in the second round. Her failure to produce a deep run caused her to fall almost 20 spots in the rankings, dropping to 96 and risking a spot in her first-ever main draw acceptance to the Australian Open. Nonetheless, her title in Mumbai ensured that she will be in the main draw during the first Grand Slam of 2018. Although Sabalenka’s season has been marred by inconsistency, she was able to produce excellent results occasionally and also made her debut in a Major. Furthermore, she created history for her country in Fed Cup, and thus deserves a season grade of B.